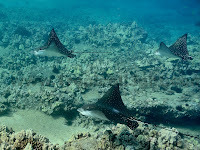 This morning when I broke through the current I found immediately below me three Spotted Eagle Rays hanging motionless. While I had to swim and swim to get through the fast moving water, they only had to waggle their wingtips to stay in place. Each time I dove down to visit with them I rapidly slid back and had to work hard to return. 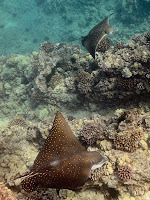 Often Eagle Rays at this location are oblivious to my presence, but today they swam off every time I got near. Fortunately, each time I made it back through the current they had regrouped to tempt me to dive down again. Our dance continued until they wore me out. I knew I could only make it back through the rushing stream of water one more time so I had to say "Adieu" as I continued my swim along the shore. I'm trying to decide... For Saturday's costume beach party, should I wear blue or red? 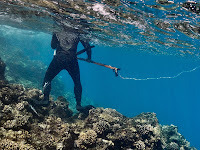 I am tired of hearing the argument that spear fishers have no impact on the reef and that any loss of fish and degradation of the coral has been caused by snorkeling tourists. My usual swim is over a narrow strip of coral which hugs the rocky shore, and I always encounter several spear fishers methodically combing the bottom for fish and octopus. They are out there covering this same small area every day. Every day. This photo is of one of the twelve spear fishers I saw this morning obviously doing his best to protect the aina. If I have to work (and believe me, I HAVE to work) at least I get to work in beautiful and tranquil locations. Today found me at the pool and recreation area for a gated community. Both the men's and women's locker rooms had outdoor relaxation areas with bubbling fountains. 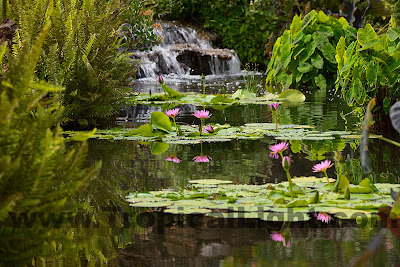 A stream with cascading waterfalls and lily pads ran around the building. And the swimming pool had an infinity edge which truly seemed to drop off into, well, infinity. 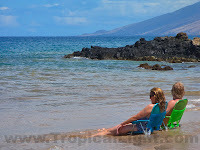 This is just one of those laid-back summer days on Maui. I did a little 10 mile walk in the morning, am off now for afternoon meetings with clients, then will spend the evening in front of the computer working. Ladybug, Ladybug . . .
Only five people showed up to swim this morning; one of them took off when she hit the water and was never seen again. I seem to be the swimming pariah. By the way, those are Evelyn's toenails. Apparently, last week they were watermelon slices. As they do every summer, our Rainbow Shower trees are absolutely going off. Our landscapers hate these trees because our sidewalks are perpetually strewn with piles of flower petals - and the grounds crew is responsible for removing the fallen blossoms. Personally, I love walking through a carpet of colorful blooms and breathing their scent on the warm summer breeze. 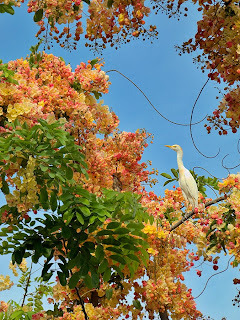 The Egrets seem to like them too, I've been seeing clusters of these beautiful white birds perched in the branches. 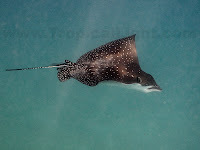 This Spotted Eagle Ray was hanging in the current in the same spot as Tuesday. Since I've often seen other Eagle Rays at this locale, this must be the trendy place to be. And I was there! That must mean that I'm cool too. You can see it in the boy's eyes: I gotta have one of those! He's probably not sure of exactly what it is or does, but when has that ever gotten in the way of the American male? 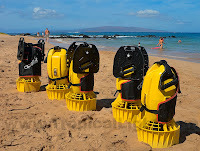 By the way, getting pulled by one of those things looks like it could be fun, but it defeats my whole reason for getting into the ocean - exercise. 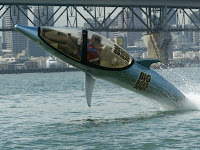 On the other hand, I would be willing to forgo a workout or two to play with a Seabreacher! My friend, Jonathan, sent me the link (click HERE) which includes several YouTube videos as well. Fortunately, I'm safe from an impulse purchase. As they say in their ad: for less than the price of a new BMW... If you've ever seen what I drive, you'd know that even my teeny tiny little kayak is a bit rich for my blood. Whoah! 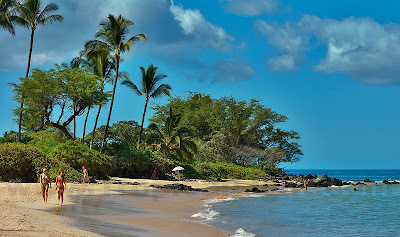 You know I must have been sick when I've been back on Maui almost a week and today was the first time I've been in the water! Unheard of! This is also the longest I've gone without blogging; and if you read my previous two posts you will know that I should NOT blog when sick. My computer should have a sensor which causes it to shut down if it suspects I have any kind of virus. The current was running today and it was loaded with jellyfish. 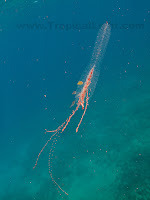 I saw lots and lots of the dangerous Box jellyfish, but not one photo turned out. Fortunately, my camera was able to focus on this jelly; it's tentacles continue on an additional couple of feet beyond the edge of the photo with little red dots all the way. I escaped with only a minimal number of stings and am looking forward to my next ocean swim. It is good to be back. I have friends who have endured unimaginable pain and suffering, yet in my last post I was whining about a little cold. Am I embarrassed? Yes. And No. Should I hide from you that I was indeed praying out loud for the angel of death to come and take me - meaning every word of it? No. I am not brave. I am not strong. At least not all of the time. And the angel of death can come back another time. The aspirin helped. I've had a great life. Sweet Jesus please bring me home. Can you tell that I don't handle being sick very well? I struggled to get out of bed yesterday and it has been all downhill since then. I am ready to leave this life behind. Maybe I should take some more aspirin, my temperature is back above 102. Happy Bastille day (French Independence day). I'm in a big city, so eating snails at a French restaurant was a must. Mmmmmm. Now, it looks like I'm eating alone, but I wasn't. I texted my way through lunch with my sweetie, sending snapshots of each course. How romantic. I stumbled across three different bands, all practicing in separate pavilions in Grant Park. 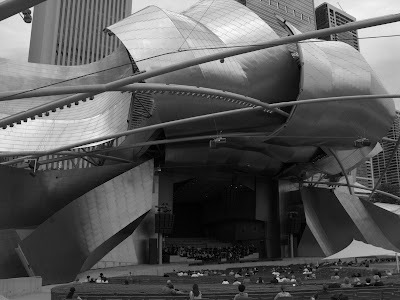 I sat and listened the longest to the world renowned Grant Park Orchestra. These musicians are the best of the best. Symphonies can be stuffy, uncomfortable affairs; but today was outdoors and they were all wearing shorts or jeans and it was Fun. Plus the music was great. Oh, and the Pritzker Pavilion is AMAZING! It really has to be experienced first-hand to be appreciated. Now where should I have dinner??? Cars cutting in and out around me at 70 mph, I've arrived in the big city! The driving might have been easier if I hadn't been trying to photograph the skyline while changing lanes and dodging other drivers. The things I do for my art. I even found my hotel on the second try. I'm glad I remember Chicago from way back when I used to live here, shortly after Mrs. O'Leary's cow kicked the lantern over... Most importantly, I found a parking spot for my car where it will remain until I leave. It will be two days of buses and trains for me. On my very first ride back in the city we were packed in like cockroaches and I got to stand next to a homeless person who reeked of stale urine, lots and lots of stale urine. Ah, the joys of city living. I walked around some of my old haunts and stumbled across one of those "Taste of" street events which included some very fine restaurants. I had been looking for someplace to eat but wasn't inspired, then I found the Halsted Tastes Better fair and got to sample a variety of great dishes. Perfect!! The evening culminated in Waiter Races where waiters had to run to a table with wine bottles, open the bottles, pour a glass of wine, then race back with the full glass on a tray. They were all so nervous that they were totally incompetent. Not one waiter in the first heat managed to open their bottle, they all broke the corks. In the second heat the two waiters who did open their bottles both managed to drop their glasses on the way back. The third and fourth heats learned from the others' mistakes and managed to slow down a little. Anyway, I'm glad to be back in Chicago - in the summertime. I had forgotten what a beautiful and clean city this is; it puts Honolulu to shame. I wonder what kind of trouble I can get into tomorrow? they move to a different set of chairs. the roller rink today. It was Great! I havent roller skated in ages. spastic fool I am, but boy did I have fun. We returned to our chairs at home with big smiles on our faces. culminated at my High School class reunion. attitude toward myself. Wow! Thanks. I ended the night standing alone as I did through most of school. got myself a green vegetable to eat. husbands and kids). Is the apocalypse near? strange, but I think they just don't understand the beauty of silence. together. After all, we are family. hours of interstate driving, I can feel all the tension falling away. are fighting. Damn noisy squirrels! Here I go again, flying away into my past. My 35 year class reunion. Remind me please, why am I doing this? Hooray! Back from Thailand and India and showing us how it's done are Janet and Patti. How great to be swimming with them again. Yeah, right - you haven't been swimming in 9 months! Way to make me feel bad! Not only did they swim the entire course, but they left me in their wake. 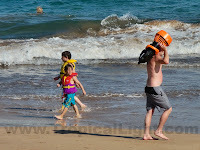 They had already gotten dressed before I hit the beach on my return. Looking for something to do on the beach this holiday weekend? 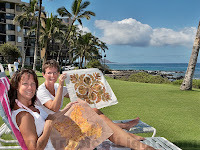 How about traditional Hawaiian quilting? These ladies took a free class at The Maui Quilt Shop and were happily sewing away when I passed them on my walk this morning. As vacationing beginners, they told me, you didn't have to make an entire bedspread. Instead you could create a single panel to be framed or to use as a pillow. Or if you are feeling a little more laid back, you could always dangle your toes in the water. Mmmm. Sounds good. When I was bitten by a 12 foot tiger shark a few years back, the hardest part of getting back in the water was overcoming the "yips." My solution was to concentrate on looking for other large underwater creatures. When killer sharks would enter my mind, I would concentrate on looking for sea turtles. That way when a dark shape would appear, my first thought would be of turtles, not sharks (yes, I can be pretty gullible). Big south waves are still rolling in and the water continues being murkier than I am comfortable in. 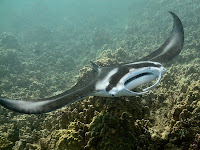 Two days ago when I started imagining big sharks while swimming, I began thinking of Manta Rays. Manta, manta, manta was my mantra. 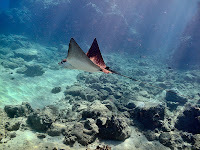 Within five minutes I encountered a Manta Ray and swam with it (click HERE for photos and story). 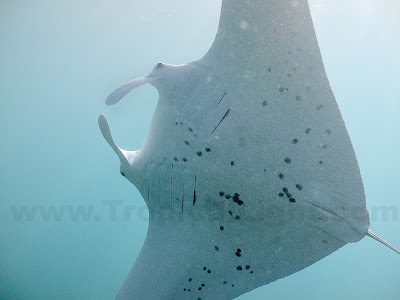 This morning when, once again, I became uncomfortable I started thinking of Eagle Rays. Not just one, I decided, but several. 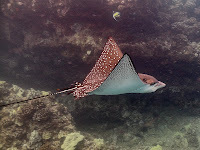 Within three minutes I swam over two Spotted Eagle Rays. I don't think they liked swimming in the murky water either because when I dove down to them, they panicked and scooted away. I looked for them but could not find them in the gloom. I swam away, then noticed one of them following me. 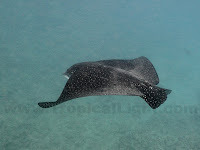 I have never seen an eagle ray behave the way this one did, it swam up, down, and all around me. I'm guessing it liked my cologne but lost interest when it finally glimpsed my face. Doug and I exchanged marriage vows before a small gathering of friends and family twenty years ago today. Then came the big wedding reception which cost us ten thousand dollars. I think our anniversary dinner tonight at the Four Seasons set us back nearly as much. We had our struggles over the years and I don't know how many times I wanted desperately to call it quits. But we always worked out our conflicts and emerged stronger for the effort and dedication. Amazingly, somehow, it keeps getting better. Thanks for everything, partner. The surf is still up on the south shores, and the water is still murkier than I prefer. Nonetheless, I dove under the breakers and managed a good ocean swim workout this morning. I met this manta ray and hung with it for fifteen minutes while it was feeding. It hugged the ocean floor about twenty feet down and getting there was a struggle for me. I am horrible at holding my breath (my personal record is twenty seconds) so I was lucky to get one photo on each dive. Underwater photography depends upon getting close, very close, to the subject; and when visibility is poor, even closer is better. Fortunately, this one didn't mind me being in hugging distance. Strange, how much manta rays look like sharks with wings.